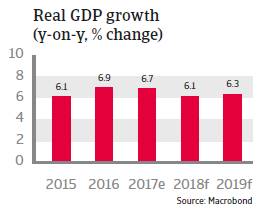 GDP growth is expected to remain at above 6% in 2018, but controversial economic policies could hamper business sentiment and foreign investment. President Duterte´s violent crackdown on drug trade, which has led to the extrajudicial killing of several thousand people, has raised major international concerns over human rights and the government´s commitment to the rule of law. Further uncertainty has triggered signs of trying to strengthen the Philippines’ ties with China at the expense of its close political and economic cooperation with the US. 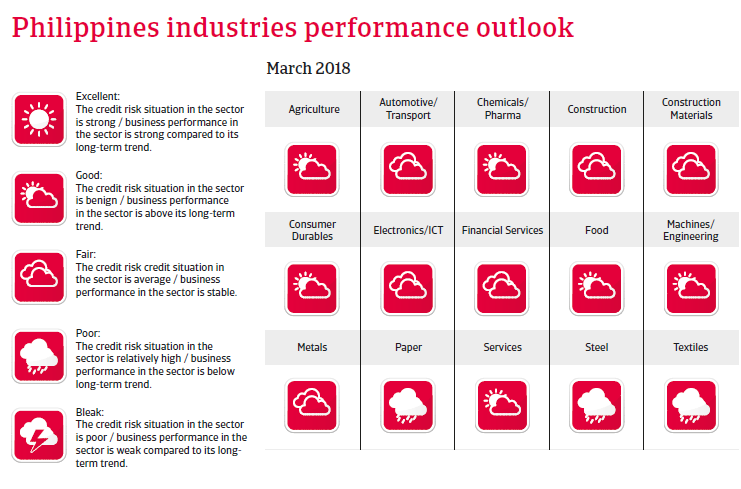 Such movements could be a risk for the Philippines’ otherwise benign economic outlook by hampering business sentiment, trade and foreign investment. The security situation in Mindanao has deteriorated after the five-month long battle of Marawi between the security forces and radical Muslim militants in 2017. Since 2012, economic growth has been persistently high, driven mainly by private consumption, which accounts for about 70% of the economy. In the past 15 years the industry of business-process outsourcing (e.g. call centers) has grown from nearly zero to about 9% of GDP. Growth has also been sustained by rising demand for Philippine exports such as electronics. 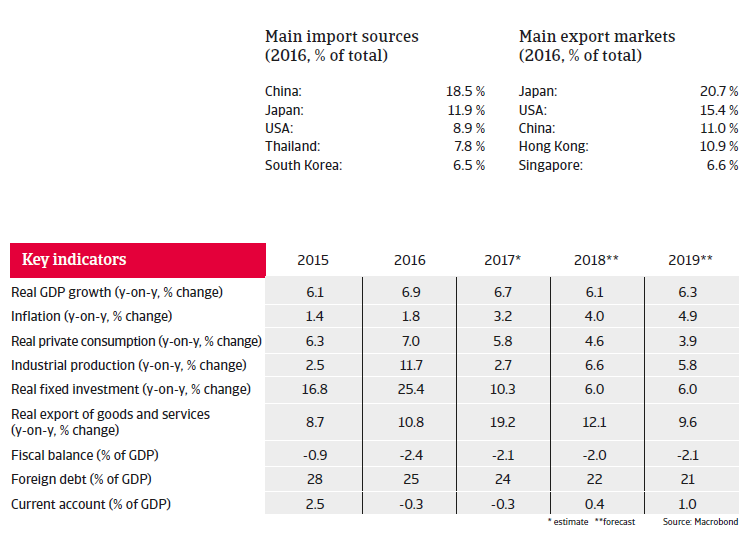 Given that the US and Japan are major export destinations, the Philippines is less affected by lower demand from China than many of its Southeast Asian peers. GDP grew by more than 6% in 2017, on the back of increased government spending (infrastructure projects) and buoyant private consumption, which was sustained by decreasing unemployment and the continuing inflow of remittances (which amounted to about USD 31 billion - equivalent to more than 10% of GDP). 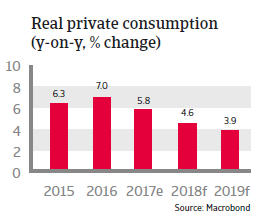 A growing middle-class is expected to sustain robust private consumption growth over the next couple of years. However, while still remaining robust, economic expansion is expected to slow down somewhat in 2018 as investor confidence has been affected by the violent campaign against drug trade, anti-US remarks in the past and some controversial economic policy initiatives on rice imports and labour laws. The Duterte administration is strongly promoting infrastructure projects, with related spending envisaged to increase from 5.2% of GDP in 2016 to 7.4% of GDP in 2022. Indeed, rail networks, ports, roads and airport developments are necessary in order to increase private investments and to safeguard high economic growth rates in the long term. A comprehensive tax reform programme is planned to finance higher infrastructure spending, and a first package (lower personal income taxes, coupled with an expansion of the value added tax base and higher taxes on fuel and vehicles) was passed by Congress at the end of 2017. Further packages (including a lowering of the corporate-tax rate and a reform of property taxes and taxes on mining) are planned for the future. With the improvement of the tax base, it is expected that the fiscal deficits and public finances remain at an acceptable level, supporting continued government spending. 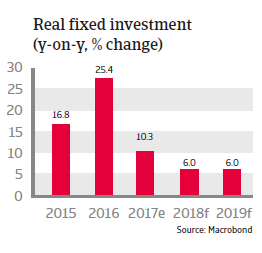 The external macroeconomic situation is robust, with manageable foreign debt (22% of GDP; 54% of exports of goods and services expected in 2018) and ample liquidity. While the current accounts have turned into deficits since 2016 external financing requirements are low and international reserves amount to about eight months of import cover.